Father McKenna, parish priest of Masterton had a school with lay teachers. He had instructed Mother Gertrude to bring good teaching nuns for the primary school. In 1897 he requested a Brigidine foundation for his parish and asked that Mother Gertrude Banahan be the leader of the Foundation, also sanctioned by Bishop, Dr. Byrne. Mother Gertrude Banahan had earlier established a special fund for the Altar. On Sunday 15 August 1926 this marble Altar from Italy replaced the borer-ridden wooden one in the Chapel. Great was the rejoicing. 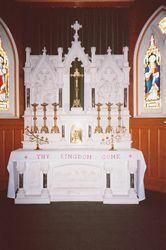 Today the marble altar stands in St. Patrick’s Parish Church, Masterton and is a fitting memorial to Mother Gertrude Banahan who brought the small band of six pioneer Brigidine Sister to Mastertion in December 1898. Mother Gertrude Banahan died in Pahiatua on 17 March 1932.